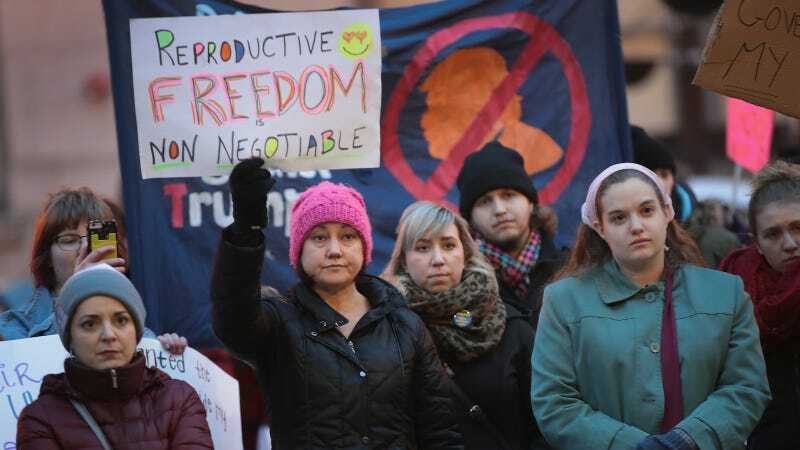 Protestors at a pro-Planned Parenthood rally in Chicago in February. Image via Getty. The Trump Administration has issued an impossible proposal to Planned Parenthood: stop performing abortions and the essential, low-income health clinics providing care to millions of Americans won’t lose federal funding. According to a report in the New York Times, officials even suggested that public funds could increase if Planned Parenthood stopped performing the procedure, a notion that seems to dangle their very existence in the face of Roe v. Wade—despite that none of the $500 million in federal funds earmarked to Planned Parenthood actually goes towards abortion services. Senator Kirsten Gillibrand, Democrat of New York, suggested that Mr. Trump had authorized the proposal because he wanted to be able to claim that he had made an offer to Planned Parenthood and that officials with the group were not being reasonable. “The Trump administration needs to stop playing political games that would put access to the full range of safe reproductive care at risk, or they will get the fight of their lives,” said Ms. Gillibrand, who described the suggested deal as a way to interfere with a woman’s medical choices made with her doctors. Trump told the Times in a statement that he is committed to being “pro-life,” but historically he’s been both pro-choice and seemingly unclear on what either definition meant. Vice President Mike Pence, however, is extremely clear on what it means to be anti-choice: in Congress, he introduced a 2011 bill to defund Planned Parenthood and has a lengthy history of blocking abortion rights both through his votes and while Governor of Indiana. A Proposed Texas Law Would Let Doctors Lie to Women About Their Pregnancies. How Did We Get Here?